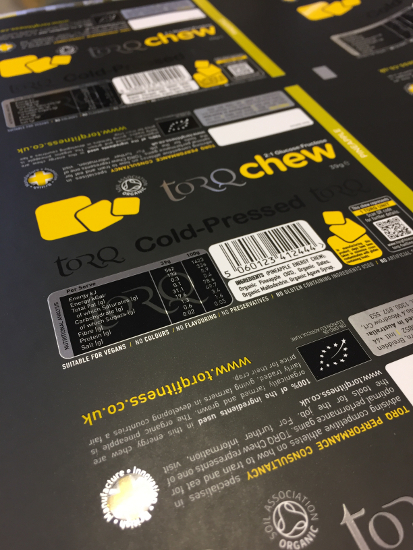 Our new TORQ Chews are cold-pressed from 4 organic ingredients and have been formulated to deliver carbohydrate to the working muscles through an optimised 2:1 Glucose:Fructose formulation. They will be available for purchase from stores countrywide from mid to late January 2016. Pack Size: Each chew weighs 39g and delivers 30g of multiple-transportable carbohydrate (1 TORQ Unit). Dose: TORQ Chews can be used in combination with TORQ Gels, TORQ Bars, TORQ Energy and TORQ Hypotonic to achieve 2-3 TORQ Units per hour. Product Summary: TORQ Chews have the texture and flavour of chewy confectionary if we’re honest, yet the formulation is certified 100% Organic by the Soil Association, so as ever, nutritional purity is once again at the top of the TORQ agenda. 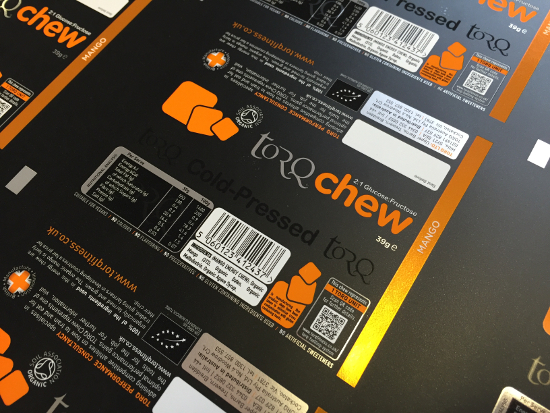 Each chew contains 30g of carbohydrate, so represents 1 TORQ Unit and forms part of the TORQ Fuelling System. TORQ Chews are deliberately a bit of a challenge to eat (they are certainly chewy), but we believe that the key to successful fuelling is all about variety. The formulation has to be optimised so that it will provide the best possible delivery of carbohydrate, but we’re all individuals and we believe in producing products that allow our customers to consume these optimised carbohydrate doses in different and interesting ways. TORQ Chew represents an innovative new way to fuel during exercise: We are always looking for ways to create new fuelling products which can be used in conjunction with other TORQ fuelling products, or on their own as a preferred choice. For as long as we are able to dream up new and interesting fuelling methods, we’re going to bring them to the market. TORQ’s Fuelling System (explained in more detail below) works on the basis of 30g carbohydrate units and, at the end of the day, which unit you prefer to use at any particular time during exercise is a completely individual choice, so by creating TORQ Chew, we’ve simply given you another choice. All of TORQ’s fuelling products have been optimised with multiple-transportable carbohydrates, so it doesn’t matter which you use. Just stick to 2-3 TORQ Units per hour. TORQ Chew is precisely formulated utilising multiple transportable carbohydrates: We analysed the concentrations of glucose and fructose within the natural organic ingredients we sourced for this project and produced a product with a precise 2:1 ratio of Glucose:Fructose derivatives. This means that the TORQ Chew benefits from the same optimal carbohydrate delivery utilised in TORQ’s other 2:1 products, so can be fully integrated into our TORQ Fuelling System. Multiple peer-reviewed published studies have proven that 2:1Glucose:Fructose formulations can deliver up to 90g of carbohydrate per hour, compared to only 60g with glucose-only derivative formulations. This has clear performance implications, because more fuel is delivered to the working muscles, reducing the drain on internal stores of carbohydrate, thus delaying the onset of fatigue during endurance exercise. Gram for gram, multiple-transportable carbohydrates are much less likely to cause gastro-intestinal discomfort due to their more rapid and comprehensive absorption. TORQ Chew integrates with the TORQ Fuelling System: Each TORQ Chew contains 30g of carbohydrate, so represents 1 TORQ Unit. Each TORQ Gel and TORQ Bar also contains 30g of carbohydrate – both again being 1 TORQ Unit each, as does 500ml of TORQ Energy. The TORQ Fuelling System is aligned with the research into 2:1 Glucose:Fructose multiple-transportable carbohydrates, meaning that the TORQ customer can consume any combination of 2-3 TORQ Units per hour for optimal fuelling. 2-3 TORQ Units delivers 60-90g of carbohydrate per hour. TORQ Chew is cold-pressed from just 4 Soil Association Certified Organic ingredients: All of the ingredients used to form the TORQ Chew are organic and the product is certified organic by the Soil Association. These raw ingredients are cold-pressed together to form the TORQ Chew without the need to cook or bake. This innovative product could not be more natural. TORQ Chew contains no added colours, flavours, preservatives or artificial sweeteners: It is of utmost importance to us at TORQ that our performance products are as natural as possible, not just for health reasons, but fundamentally because we consider that anything added to one of our products that doesn’t essentially need to be there, is a barrier to absorption. If it’s not needed, we don’t put it in. TORQ Chew can be used for fuelling alongside all of TORQ’s other fuelling products: As explained above, all of TORQ’s performance fuelling products are composed of 30g units of multiple-transportable carbohydrates, so all the user needs to do is ensure that they consume 2-3 TORQ Units per hour during sustained exercise. When perspiration rates are high, the user will naturally drink more TORQ units (TORQ Energy or TORQ Hypotonic), meaning that they need to eat less. When perspiration rates are low, the opposite is the case and the user will drink less, so will need to eat more solid fuel (TORQ Chews, TORQ Gel and/or TORQ bar) to achieve sufficient fuelling units. No one else makes it this simple. Runny: TORQ Gels, without a doubt, represent the easiest way to deliver 30g of carbohydrate in the TORQ range, so are ideal during high intensity racing when the fuel is required, yet minimal effort and time is preferred during consumption. That said, the flavours and texture of TORQ Gels are so good, they are popular with everyone, whether in a rush to consume the calories or not. Soft: Our TORQ Bars are just about the most moist energy bar on the market, so for a solid fuel source, they are exceptionally easy to consume. They aren’t ideal for use during high intensity racing, but are perfect to consume during longer events and training sessions, because they have more ‘substance’ than a gel and are still very easy to consume. Chewy: TORQ Chews have been deliberately formulated to represent a pleasant challenge to eat and can be consumed in all circumstances where our TORQ bar would usually be taken, as well as being extremely popular as a ‘trail snack’ for folk who like to stop to take on fuel and treat themselves to something deliciously moreish. Because of the chewy nature of this product, we do recommend that you keep the TORQ Chew in the back pocket of your jersey, next to your body in cooler weather to maintain the perfect texture. Ingredients (Mango Energy Chew): Organic Mango, Organic Dates, Organic Maltodextrin, Organic Agave Syrup. Nutritionals Per 100g: Energy kJ/kCals: 1398/329, Fat: 1g, Saturates: 0.4g, Carbohydrate: 78g, Sugars: 41g, Protein: 1.5g. Nutritionals per 39g Chew: Energy kJ/kCals: 545/128, Fat: 0.4g, Saturates: 0.2g, Carbohydrate: 30g, Sugars: 16g, Protein: 0.6g. Allergen-Free: No gluten containing ingredients used. Ingredients (Pineapple Energy Chew): Organic Pineapple, Organic Dates, Organic Maltodextrin, Organic Agave Syrup. Nutritionals Per 100g: Energy kJ/kCals: 1413/333, Fat: 0.9g, Saturates: 0.3g, Carbohydrate: 79g, Sugars: 44g, Protein: 1.3g. Nutritionals per 39g Chew: Energy kJ/kCals: 551/130, Fat: 0.3g, Saturates: 0.1g, Carbohydrate: 30g, Sugars: 17g, Protein: 0.5g. Allergen Free: No gluten containing ingredients used. TORQ Chews will be available for purchase at stores all over the UK and from our Online Shop from mid to late January 2016 (within a month of this article going to press). For further information, give us a call on 0344 332 0852.